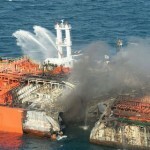 On December 29, 2013, the 55700 gt car carrier Gravity Highway collided with the 44404 dwt chemical tanker Maritime Maisie off Busan, South Korea. 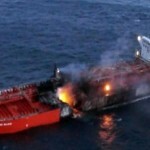 The car carrier was on sea trials with 64 staff and crew when it struck into the port side of the tanker. 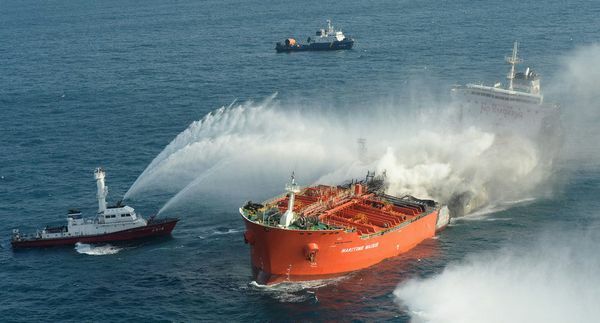 The Maritime Maisie suffered 8 meter hole and suffered a small explosion as two chemical containers of paraxylene and crylonitrile caught fire. Authorities dispatched over a dozen rescue vessels and helicopters to the scene. 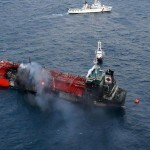 All 91 persons from both vessels were safely evacuated. 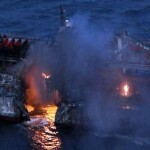 Some crew suffered minor injuries from slight burns. 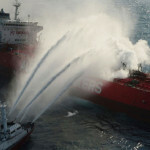 Authorities stated that the fire was under the control, but some 4000 tons of chemicals had already burned. 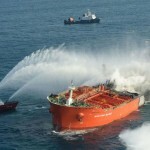 The tanker may break-up or sink as the vessel developed a 20 degree list from the water ingress. The Maritime Maisie was en route to Ningbo from Busan. The car carrier was taken under tow to a nearby shipyard. Authorities have launched an investigation into the incident.